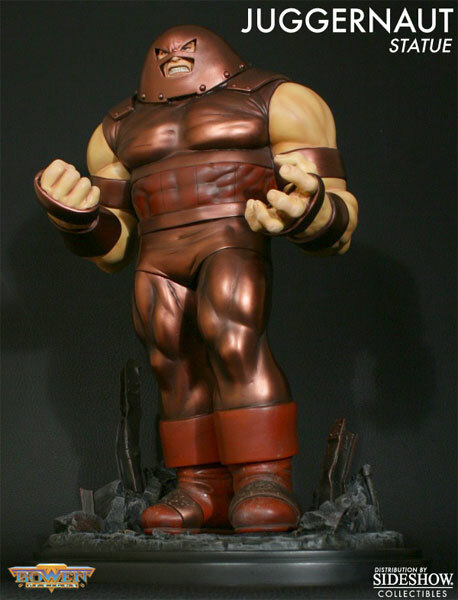 Pre-order the Marvel Juggernaut Statue from Sideshow Collectibles today! The Juggernaut — an indestructible force for whom there is no immovable object. Juggernaut’s first Marvel comic book appearance was in X-Men #12 (1965). Juggernaut is Cain Marko, the half-brother of Charles Xavier, leader of the X-Men. Upon discovering an ancient hidden temple in Korea, Marko finds an ancient ruby with an inscription. Upon reading the inscription aloud, Cain is granted the awesome strength and invulnerability of the Juggernaut. The Juggernaut statue is sculpted by Phil Ramirez of Bowen Designs. It stands 14″ tall, and it also features a ruby-colored crystal (the source of Juggernaut’s power) packed separately. Break through all barriers to pre-order the Marvel Juggernaut Statue!